Cute or creepy? I’m not exactly sure but that doesn’t take away the fact that the Evolution slot by NetEnt is a pleasure to look at. The app is a mobile touch version of the famous fruitmachine. 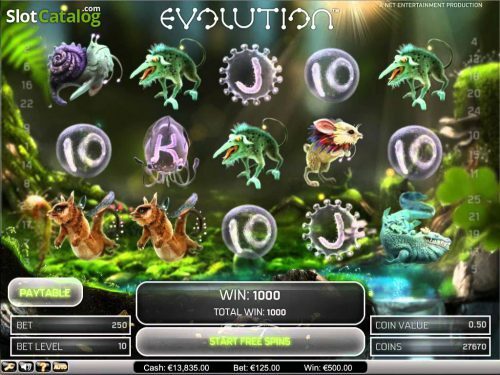 The Evolution slot takes you on an underwater adventure back into time. You’ll see many strange creatures transform and as they do, you can earn cash. The slot is accompanied by some mysterious music and even more mysterious creatures. Your attention will be grabbed at the sight of the many weird things you see on the reels. Like you can expect for a slot app with this theme, most of the symbols are prehistoric creatures. You’ll see a creepy dragon look-a-like, a sort of squirrels with bee-wings and mice mixed with birds. Yes, this slot sounds weird before you even start playing it. But you’ll love how much fantasy went into each image you see on the reels. This slot is not hard to understand but you might want to play it for free first without spending the real deal. Simply click on one of the selected casino links to play it. This slot has a total of 25 paylines and you’ll have an opportunity to win many free spins. If you get yourself in the free spins mode, winning combinations automatically increase to the next highest combo. Another out-of-the box thinking kind of slot created by NetEnt. This one truly takes you to another world, if not by their creatures definitely through the background music. NetEnt has been a star business in the online gaming world for years and it’s easy to understand why their success is hard to top. Their graphics are unparalleled, the set-up of each game is comfortably to look at and you can play it both from your mobile phone and laptop with ease. Score. This fruitmachine is available for both iOS and Android phones. To set your bets, scroll down to your screen where you find the paytable. The maximum amount of coins you can bet is 25. 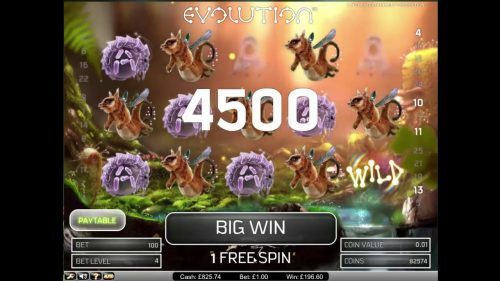 There is no progressive jackpot on this slot but there is a jackpot amount of 2500 coins. On the paytable you can also adjust other things on the slot, for example autoplay mode or max bet.